Beautifully decorated 3 bedroom condo with a spectacular view! 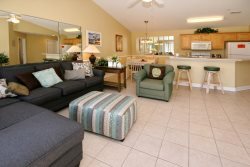 Located on the Sandpiper Bay Golf Course. This condo features 1 King size bed in the Master bedroom, 1 Queen size bed in the first Guest bedroom and 2 Twin size beds in the second Guest bedroom. Modern appliance and flat screen TV's, WiFi and a fully stocked Kitchen. This condo is the perfect home away from home for your next getaway. Amenities include, 2 outdoor pools, tennis courts. Flat Screen TV's and WiFi internet access. Close to bridge to Sunset Beach. Condo also includes Full size washer and dryer. All bedroom and bathroom linens are included and in the condo for you when you arrive. Also the Kitchen is fully stocked with all of the appropriate cooking utensils dishes and cutlery.